Swimming pool coping is the paving at the water's edge of your pool. It's really important that you choose one that goes well with the rest of your pool decking. 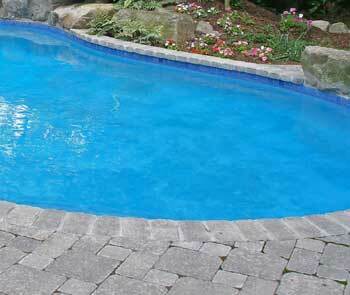 The coping can either match your swimming pool paving or it can be another material to create a contrast. Often the edge on the water side is rounded for easy gripping while in the pool, but that is not a necessity. Here are some paving materials and some copings you might select. There are both narrow pavers and wider ones that can be used for pool coping, depending on the particular paver and the company. The narrow ones are often 12" long and the same width as the pavers. In my opinion, the wider ones are nicer looking and more up to date. 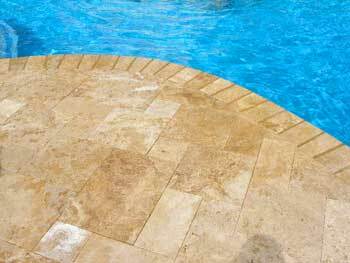 Depending on where you purchase the travertine from, there are different coping sizes available. 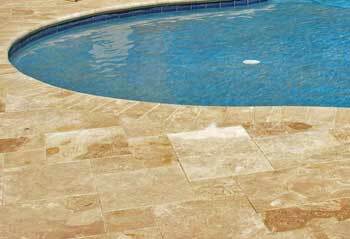 They are ordered as bullnose travertine; they are rounded along the water's edge. 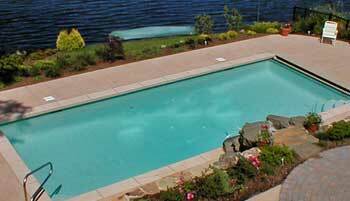 Concrete pool coping can be part of the entire pour and come up to the water's edge or it can be a separate coping. Masons have differing opinions on this. I feel it can be done either way, depending on the look you want. 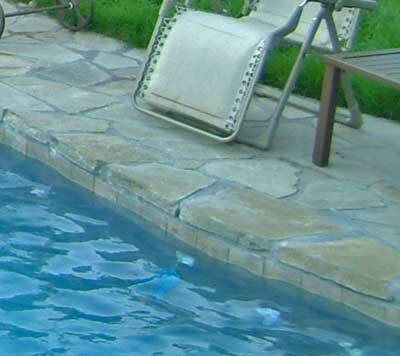 This shows concrete swimming pool coping on a vinyl liner pool. It was a separate poor. The coping is a different color than the rest of the swimming pool decking. You may like this or may prefer the look of one continuous mass of paving without the break. 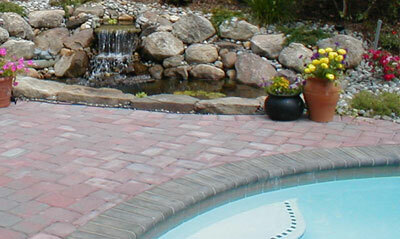 If you are doing a natural stone pool decking, you will want to do the same for the coping. Here is a photo of one that is seamless. It's beautiful, but note how the edge is not rounded. This is something that may or may not be important to you. Note: Stone copings can be hot (except travertine) so be aware of this if you are considering stone.